There’s a lot of news these days about Russia and the US. Friend or foe? Well, let me tell you a story. When I was about 12, I was picking on my brother, bullying him and pushing him about something petty. My Dad, a Vietnam vet, saw this and violently threw us apart. “What the hell are you doing? You guys are brothers. You have to take care of each other.” He laid into us a rage that I didn’t understand at the time. Now that I’m a father of three, I can feel where that comes from. It can destroy me to see two people you love not helping each other. It’s pure tragedy to see loved ones at each other’s throat. One of my favorite students is Russian. I’ll find him in the halls working on music, making “space beats” and electronic music. He lets me listen on his headphones, we jam. He dreams of making people happy with his music. A goal is for his music to be played at his prom. How could America ever have threatened to annihilate Russia? How could Russia ever have threatened us? When you get to know people from all over the world that rage I felt from my Dad becomes understandable. When we hear of countries wanting to fight each other on this 3rd rock from the sun we should all feel a little rage. Whatever we are fighting about is trivial when we consider the size of our solar system, our neighboring star, our constellation, our galaxy, all the visible galaxies—petty. London, 1941: 8 months of bombing had devastated the cities, over 20,000 dead. Arthur C. Clarke looked over the city as it was laid to ruin. What did he feel? Surely he knew families that were victimized by World War II. Was that an impetus to get man to the stars? Clarke’s career that followed certainly would indicate he was part of a conspiracy for a better world. His work is too epic to summarize in a blog this size. However, his work introduced the public to alien life forms. How does life evolve with 2g’s, 3g’s or ½ g? Even when I was a kid the idea of alien life was a little out there. People would snicker if anyone in my neighborhood thought aliens could exist. Now having met many NASA scientists, aerospace engineers and astronauts over the years, the consensus is, of course, alien life exists. Who will find it first is the real question. I challenge you to survey your group, class or office. I definitely feel that survey would have been different 20 years ago. What was Clarke’s contribution? What could a sci fi writer contribute? Clarke predicted that an artificial satellite placed at a height of 22,248 miles directly above the equator would orbit the globe at the same speed with which the earth was rotating and the satellite would remain stationary with respect to any point on the earth’s surface. By the way, did anyone enjoy the Clarke belt today? AKA Geosynchronous orbit. Have you ever watched a game broadcast from space! A geosynchronous orbit was proposed by the science fiction writer, Arthur C Clarke. The scientists who were motivated by his captivating stories wanted to know: Is it possible? And then made it happen. I’m a Mars MAVEN Education Ambassador. 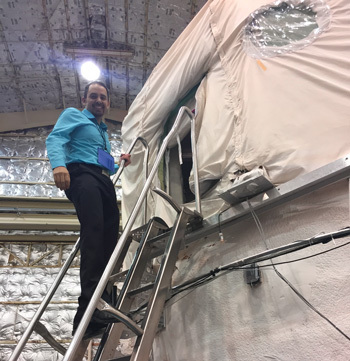 I’ve been briefed at the Goddard space flight center. I had the privilege of having lunch with some of the engineers who design these things. Some of them had even been part of the Curiosity team that landed the rover at the Bradbury site. Bradbury…wait that’s another post. As I mentioned in my last blog, sci fi and the authors from that golden age were in a conspiracy to help man survive and to give him a better world. Earth was headed for and still teeters on oblivion. 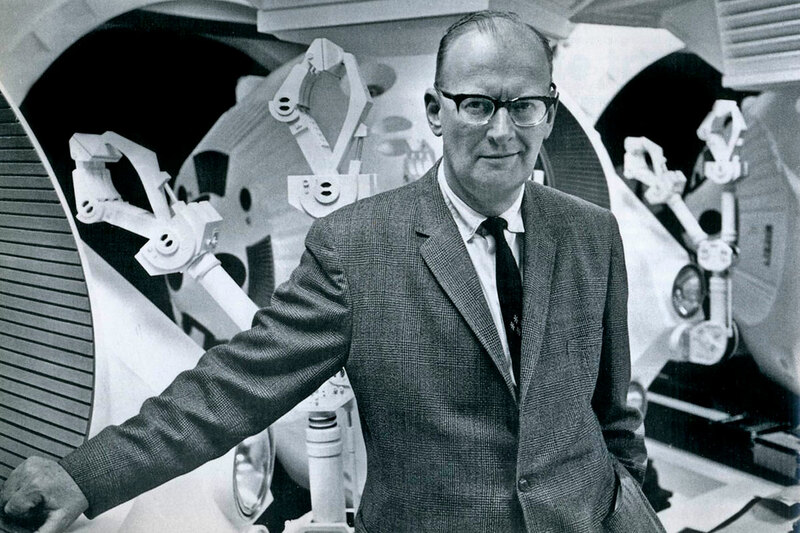 If it were not for that “merry crew,” putting man’s attention on the stars, just as Arthur C. Clarke did, today may have become a very different scenario. In fact, would you even be able to read this on your phone if it weren’t for Arthur C. Clarke?